Fifth Business (1970) reintroduced Mr. Davies after more than ten years to a very appreciative audience and some of the same characters appear here although the two novels are quite independent. Davies is a thoughtful, tasteful mediator in human affairs and while the earlier book was concerned with "moral bookkeeping," the audit here is psychoanalytical, attempting to release the submerged life of feeling of a rigid rationalist. He's David Staunton, a most successful Toronto lawyer, who suddenly finds he's lost control of himself in a theater shouting "Who killed Boy Staunton" -- his father. Staunton senior had been found in his car at the bottom of a harbor with a stone in his mouth -- pink granite. After this showy beginning calculated to arrest your attention, Staunton goes to the Jung Institute in Zurich where under the quiet Johanna von Haller he undertakes a Jungian analysis. Dr. von Haller keeps the Jungian cabalism to a minimum although you will be inducted from anima to persona to archetype (the manticore) while Staunton is forced to reconstruct/revise his relationships -- primarily the lack of them -- with his father, the non-existent women in his life, and his mother whom he was led to suspect had an affair with Dunstan Ramsay (a principal character in the previous book). The last inset which leaves David Staunton still uncommitted and which has also featured some startling circumstantialities suggests that this account may be resumed, if only to determine whether David will continue to live only the half life of the mind (esse in lntellectu solo). 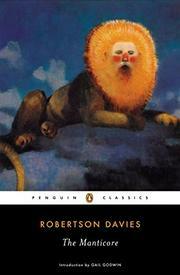 One questions whether all readers of the earlier book will be as comfortable in the penumbra of the collective unconscious; still Davies is a donnish, civilized and discreet guide. He also returns the novel to its primary domain so that it serves its resident characters on the level of insight rather than sensation.